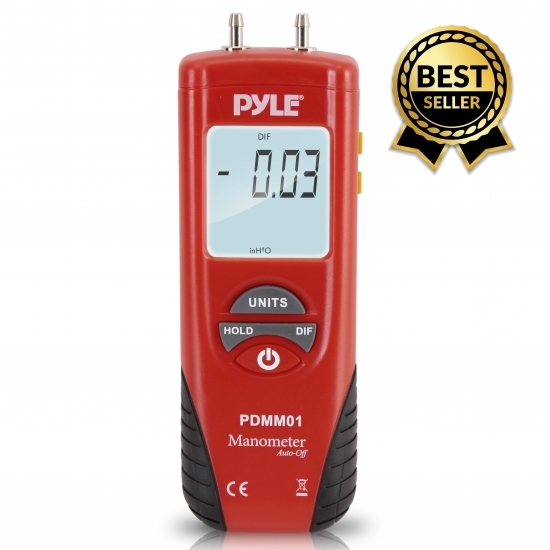 Measure pressure with this digital manometer from Pyle. It can measure in 11 different units, including in H2O, Psi, Mbar, Bar, kPa, inHg, mmHg, Ozin2, ftH2O, cmH2O, and KgCm. Displays maximum, minimum, average, all with relative time, on the large backlit LCD dual display. Data hold and error code keep you on top of your data. 2 soft hoses and 9V battery included. The unit is factory calibrated, if your unit is no longer reading correctly it needs to be repaired or replaced by a Pyle technician. How do you calibrate the PDMM01? Step one, 0000 mode, 0, Long press REC button then press power on button, release the REC button when display REL , change the unit to inH2O, then press REC+HOLD, release when display 0000 , it enters to zero calibration mode, after confirm the input port is not pressure, then press REC+HOLD to enter to 5540 modeStep two, 5540 mode, 55.40inH2O, Access the right input port of the unit to calibration equipment, access the other port of calibration equipment to the right input port of DDM55 standard instrument, adjust the pressure, when the standard instrument display inH2O/55.4, then press REC+HOLD enter to 2770 modeStep three, 2770 mode, 27.70inH2O, Adjust the pressure, when the standard instrument display inH2O/27.70, then press REC+HOLD to enter to -5540 modeStep four, -5540 mode,-55.40inH2O, Adjust the pressure, when the standard instrument display inH2O/-55.40, then press REC+HOLD to enter to -27.70 modeStep five, -2770 mode,-27.70inH2O, Adjust the pressure, when the standard instrument display inH2O/-27.70, then press REC+HOLD to enter to -REL mode At last, press REC + back-light to save the standard data.